My Mom and sisters and I just recently returned from a one week tour of the Garden Route and Cape. We brought my one-year old son along as well... in fact, he was part of the reason we decided to take the motor home, rather than staying in hotels. Most motor homes don't come equipped with wireless internet, and so I had to keep a journal the old fashioned way - with pen and paper! Overall, the journey was pretty incredible, and I was so thankful to have the opportunity to see more of this beautiful country during our stay. My son did really well, and having three woman to help entertain him and care for him (while I drove for six days), was really helpful! Well, without further ado, here's my first entry. Nature is... exquisite, treacherous, enchanting and mesmerizing. It is often indescribable in its beauty. In the ocean, every wave is different; so powerful, and yet so beautiful. They pound the volcanic rocks, and form waterfalls as they rush to rejoin the sea. It's simply incredible; divine. I'm at the Tsitsikamma National Park, and it's the second day of our road trip. I've just won my daily battle with the baby, and he is, in fact, sleeping. Mom and the girls (my sisters) went on a hike, and since it's overcast and I've hiked here before, I signed up for baby duty. I'm taking advantage of this time to watch each incredible, marvelous wave, and do a bit of journaling. Yesterday we drove about 230 km, or from Mossel Bay to Tsitsikamma, stopping in Sedgefield, Knysna, Plettenberg Bay, and the "Garden of Eden" along the way. The baby was pretty good, and mom and the girls enjoyed the craft market at Sedgefield and the African souvenir market in Knysna. The drive itself is incredible, taking us through various lagoons, mountains, and gorges, not to mention the various "Heads" (or cliffs jutting out into the sea). At the "Garden of Eden" we stopped to do a short hike through a fern-filled forest - how refreshing! We arrived in the Storms River section of Tsitsikamma just in time to get settled in and watch the sun set over the jagged cliffs. I got some great photos! Then the baby insisted on joining his Aunties in the salt-water pool overlooking the surf... he had a blast, and I got a cute video of him swimming in his birthday suit (he'll be so embarrassed when he sees that in 15 years)! After showering off, we got ready for dinner, but since it was pretty late, we just had a simple salad. Since it's a bit overcast today, I think we'll pack all our stuff together and head inland, but for now it's my turn to do a bit of hiking. So long! Before we left Tsitsikamma yesterday, I hiked to the suspension bridge with one of my sisters. It's a beautiful hike, but I found it very difficult to tear myself away from the pounding surf that had captivated me that morning. In the afternoon, we decided to get back on the road, heading westwards and to Nature's Valley (which is still part of Tsitsikamma N.P.). After paying over 400 Rand to camp at the Storms River Mouth on Saturday night, we opted to camp out in a quiet neighborhood last night. Nature's Valley is a very peaceful little town surrounded by mountains and lush forest, and because of its remoteness, the fear so prevalent throughout much of the country doesn't seem to exist in the minds of these locals. Last night, we ate dinner at what I suspect is the only restaurant in town, but the food was good, and the staff was friendly. First thing this morning, I took the video camera and went for a short walk to the beach, where I saw a lone fisherman walking down the desolate beach. A little later, I saw a woman coming up from the beach alone, after just having gone for a swim in the surf. These are the kinds of things you don't often see in other parts of the country. It took us a while to get on the road today, but once we began driving, we followed the old road to Plettenberg Bay. Again, we were surrounded by lush green forests and mountains, but as the road flattened out, we came upon a large group of baboons, who also appeared to be using the street as a means of travel. They seemed as curious of us as we were of them, but other cars just sped by, nearly flattening anything in their path. In parts of the country they're protected, but not here. South Africans have a history of protecting only the most cooperative animals. Baboons, jackals, elephants, lions, and various other animals have been slaughtered over the years, as a "threat to mankind". The Cape Lion is extinct, and there are certain species of baboons that are already on the brink of extinction. 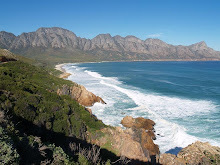 Once we reached Plettenberg Bay, we had breakfast at the water's edge at a little restaurant called the "Lookout", then headed inland towards Oudtshoorn via Prince Alfred's Pass. In case you are planning to do the same, I would not recommend it. The road is narrow, much of it is gravel, and there are few guard rails. At the speed we traveled, it took us a couple hours to get to the other side of the pass, and by the time we did, we were very low on gas. Fortunately for us, there was a gas station nearby. Unfortunately for us, they filled the wrong tank. 400 Rand later, we were told that we had a crack in the gas tank, when really, water tanks are not designed to hold massive amount of diesel fuel. And so we decided to head back to Mossel Bay for the night, but first, we had to cross another mountain pass, this time with dense fog and no visibility. As you can see, we did make it back to Mossel Bay! We had the motor home flushed out and had a quick dinner, and now it's time to retire (I'm exhausted)! After viewing the caves, we headed through the Langeberg Mountains, stopping in Montagu to camp. Had we not been racing the sun to get there before total darkness, we could have driven north, taking the "Seven Weeks" Pass, which is supposed to be spectacular. Despite the fact that we took the not-so-exciting route, the drive there was incredible, and we enjoyed watching the sun as it slowly disappeared behind the mountains on the horizon. Once we arrived in Montagu, we met the people camping next to us, and boldly suggested that they lend us their grill for dinner. They kindly obliged, which allowed us to cook our chicken skewers and veggies in the great outdoors. This morning, the baby and I got out of the RV early, to allow the others to sleep in a bit while we explored. The caravan park is sandwiched between the city and vineyards, and on our walk we saw ponies (and the occasional bird or neighborhood dog) as well as what appeared to be some very historic homes. There's also a river going through Montagu, accompanied by a quaint little footbridge. Later, we took a walk into town with the others, in search of breakfast. After a long walk down the main promenade, we settled on a little café at the beginning of the street, where we had eggs, bacon, toast, and cappuccinos... then left, fully charged for the day's adventures. From Montagu, we headed to Robertson, pausing at a rest stop on "Cogman's Kloof" for photos and a short hike. With the baby in the hiking backpack, we were able to wander up "Kalkoenkrans", to a stone fort built be the British in 1899 (during the South African War - in order to deny access to "Boer" or farmer forces). The main attraction in Robertson, itself, is the wineries, so we stopped for a tasting at the well known "Robertson" brand winery. After making our purchases, we got back on the road and headed to Worcester, and once there, we paused to withdraw some money and make a couple of small purchases. Afterwards, we began our search for the elusive Goudini Spa and Campground. Although we spotted the name of the spa on a distant hill, the signage was so bad that it took us over an hour to find... using a navigation system and a small army of navigators and maps. Once we arrived, we set up camp, then my youngest sister and I took the baby and headed for the hot springs (fortunately for me, my underwear looked like a bathing suit). My Mom and other sister were going to prepare dinner, but after the small propane disaster, where the propane appeared to be saturating the motor home, I had a bowl of cereal and headed off to bed with the baby. The day began with another visit to the hot springs (this time just Mom & I). Afterwards, we packed up and got on the road, heading over the gorgeous Du Toit's Kloof Pass, and then through the city of Paarl, to Franschhoek. Franschhoek is a picturesque and historic town which was founded when a small colony of French Huguenot refugees (207 to be exact) arrived on the Cape after fleeing France (du to religious persecution). It is famous both for its many fine restaurants and its wine, and so we stopped for lunch at the Grand Provence vineyards. Here's an excerpt from the winery's website, "Grande Provence Estate wears her 300-year history with dignity. Sitting in the magnificent Franschhoek Valley in South Africa's Western Cape, her lush vines spread across 30 hectares with gentle vistas over the valley floor, at odds almost with the rugged mountains beyond. 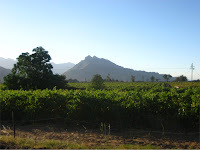 This is heartland South African wine country." Doesn't that sound exquisite? The food, wine, and service were outstanding, and although the baby was a bit of a handful, we took turns playing on the big, grassy, lawn with him. Lunch was served outside, but we had to walk through the "Jonkershuis" to get to the bathrooms, and the combination of beautiful, rustic furniture, accented by a log fire and a few tasteful modern accents, made it quite eye catching. Just the way I envision our future house to be! After lunch began the real adventure. For some reason, our navigation system (which we had borrowed from a friend), preferred gravel roads and private property to highways. The setting was "fastest route", but our route would have been more accurately described as "scenic" or "all-terrain". I think she took us on the R45 over the Franschhoek Pass and Theewaterskloof Dam, then a small unmarked dirt road over Vanderstels Pass and onto Caledon. From Caledon we drove through multiple farms on a dirt road leading to Hermanus, but not before stopping at a local farm to get further directions (the farmer looked bewildered to see a motor home on his farm, that just happened to be full of women, all of them foreign... "I better cut back on the cow dung." No, I believe his actual words were, "And this thing told you to drive through my farm?"). Along the way, we spotted antelope, cattle, horses, a tortoise... and the quill of a porcupine! That evening we stayed in Paradise Park... whose name is most misleading. Today was the last day of our road trip, and Mom's last day in South Africa. We started with breakfast at a little outdoors café in Hermanus, a bit of souvenir shopping, and some photos. Hermanus is a prime spot for whale watching, but is a pleasant city to visit even outside of whale season. Afterwards, we packed up all of our gear and headed towards Cape Town to turn in the RV. Our bed and breakfast was in Oranjezicht, a charming little neighborhood close to the city center. 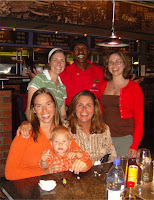 After settling in, we headed out to my favorite South African restaurant, the "Cape Town Fish Market". They have outstanding food and service there, and the one we went to is right on the Waterfront, a must-see for Mom on her last evening. We sat in the Teppanyaki section, and our chef, George, kept us well entertained as he prepared our food. This morning we dropped Mom off at the airport; having breakfast together at a restaurant in the terminal before she left (we were so sad to see her go)! Afterwards, we drove back to the B&B, taking advantage of the "breakfast included" before venturing off into the city. Breakfast was followed by a quick walk around the Oranjezicht, where we discovered a mall and local grocery store. After taking a short nap we decided to head back down to the Waterfront, but before departing we saw a huge fire on the mountain adjacent to where we were staying. Helicopters and fire engines were doing their best to put it out before it spread to surrounding houses, and once we arrived in the city center, we noticed a red, blinking light on the pedestrian bridge at the Waterfront, indicating that it shouldn't be used during fire. They successfully put the fire out, though, and in the meantime we enjoyed the Waterfront's resident seals, as well as the markets and surrounding shops. For dinner we went to a Portuguese restaurant near our Bed and Breakfast, which was ok, but nothing to write home about. After having breakfast at the B&B, the girls headed out to the Cape of Good Hope. The baby and and I opted for a slightly less stressful day, exploring the neighborhood and visiting a nearby café for lunch. Once the girls returned, we met some friends visiting from Germany at the Café Paradiso on trendy Kloof Street. We had our last breakfast at the B&B, and then packed up. Having spotted the "Seattle Coffee Company" on Kloof Street Sunday evening, we decided this was a must-visit location on our last morning in Cape Town. After getting our fix of American-style java "To-Go", we headed to the Kirstenbosch Botanical Gardens for the free 10 AM tour. The Gardens are really quite amazing, and as the only people on the tour, were able to ask lots of questions about South African flowers and fauna. A perfect way to spend our last morning in Cape Town! From there it was onto Mossel Bay, a 4 hour drive through the mountainous Western Cape. Besides ridiculous amounts of construction and partial road-closures, the trip home was fairly uneventful, and we arrived home in time for dinner that night. And that, my friends, was our exciting family road trip. I hope you enjoyed it as much as we did... it was stressful at times, but we sure did create a lot of memories! Once again, I've fallen behind with my blogs. In the past couple weeks, Lukas has become such a little boy. He's built like a little boy, laughs like a little boy, and can throw tantrums like a little boy... our baby's growing up! He has two molars now. The first one came in on the last day of our Sun City trip, and we noticed the latest molar on the day that we dropped Tobi off at the airport for his business trip last week (on Saturday, March 3rd - the first one came in on the left side, and then on the right). Our latest adventures include a trip out to a farm in the Kammanassieberge (or Kammanassie Mountains - February 21st) for a childrens' birthday party, another visit to the Botlierskop Game Reserve with Grandma, a bit of shopping with Grandma, and miscellaneous other small adventures. In other big news, Lukas is off of the breast during the day, and only wants to nurse at night now. That will make things a lot easier on the Great Moore Adventure (a road trip that I'm taking my Mom and sisters on - we leave today)! Well, I better get going, we have to finish packing and hit the road! Stay tuned for some fun stories and photos! Surprisingly, the most dangerous aspect of South Africa isn't its astoundingly high crime rate. It is ignorance and intollerance. Living in this country has given me a whole new appreciation for the American civil rights movement, and the people that dedicated their lives to making those monumental changes. How did they do it? What was their secret? And where are those people now? Would somebody please send them to South Africa? Last night I heard someone say that "Black people are stupid." This same person used the South African equivalent of the "N" Word, then asked me what the word was that we use in America. I answered that words like that aren't used in America anymore, except by ignorant people. This same person has a black maid, who's worked for the family for years, but is treated like no more than a servant. She looks miserable, but she lives with them and continues to work for them, because she's very poor and comes from a place several hours from here (so she doesn't have a home nearby, and can't find work in her "home town"). In essence, slavery is still very much alive here. Most black people in this region work as maids, or in manual labor. If they work in manual labor, they are generally picked up from their ghetto by the truckload, and one generally sees them huddled together, covering their heads and/or ears with whatever they can find, trying to shield themselves from the cold, wind, and sometimes, rain. Animals are transported in better conditions here. But to get back to the subject, how are things ever going to change here? What needs to happen to make life better for the indigineous communities? It can't go on like this forever. It's hard to do nothing, and yet one doesn't know where to begin or what to do. The changes that have to be made are so dramatic, so huge, that climbing Mount Everest seems a more realistic goal. And yet something must be done. It seems impossible, really, to change the minds of some of these people, when they have had such racist thoughts ingrained for years, but it happened in America, so why couldn't it happen here? Any ideas, dear friend(s)? I would love to get my hands on a good book about the American civil rights movement. We learned quite a bit about it in school many years ago, but it has a whole new significance for me now. Those people were truly amazing, and I wan't to know all about their amazing feats, and the incredible lives that they lead. The changes that America has undergone over the past half century is proof that where there's a will, there's a way.